designed by and for the robotics hobbyist. The Axon was developed for robots that go beyond the basics. With the Axon, you will no longer need to worry about not having enough I/O as it has 55+ for you to use - up to 16 ports for analog sensors, and up to 18 for interrupts. You will never be wanting of UART, as there are 3 directly available, with a 4th used for a USB connection directly to your PC. No additional programmer needed due to a built in programmer (bootloader). Lastly, extensive source code and tutorials have been developed to make it easy enough for a beginner. More specifically, the Axon is the best microcontroller on the market for multi-limbed robots such as bipeds, spiders, and robot arms. 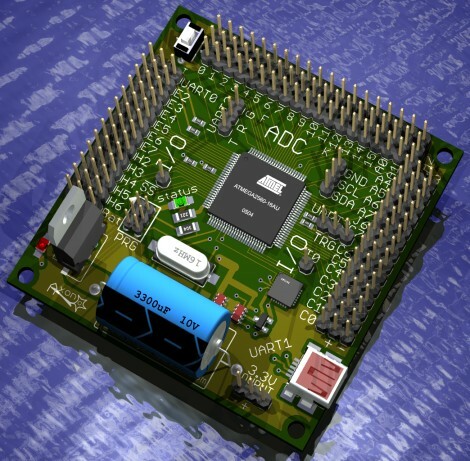 Unlike many other robot microcontrollers on the market, no additional wiring is required. It is 100% plug-n-play - no external power buses required to plug in servos or sensors, literally taking minutes to set up. The Axon uses the powerful ATmega640 as its processor, which has typically 4x more memory than other controllers on the market (see specifications below). Lastly, at 34 grams (a typical 9V battery weighs 40g), the Axon is the smallest and lightest of any other comparable full-featured microcontroller on the market. NO soldering or assembly required! Works right out of the box, with multiple working demo programs pre-installed. All Axons sold after Nov 18th, 2008, are RoHS compliant. Axons sold before this date have a black 'L' written on the bottom side. Full personalized support by the Axon creator and SoR author himself! Stuck? Post a question in the robot forum and read previous Axon questions - no question is left unresolved. I will be continually adding easy to use software to support all your favorite robot hardware. This is all included in the price. Remember to read the FAQ first before asking!!! Free access to plug-n-play SoR Scope, software that converts your Axon into a 16 channel oscilloscope. Who wants to spend hundreds or thousands on a clunky oscilloscope anyway? No programming necessary. For detailed information, please refer to the Axon Datasheet. To reduce costs, items ship once per week. Receipts will only be included/emailed by special request - contact us. You may also purchase from one of our official dealers for additional purchasing/shipping options. For countries that are not supported by Paypal, you may send money by Western Union (contact SoR directly). Feature comparisons between other popular robotics microcontrollers. * Does not include shipping or shield. ** Does not include servos, battery, and programmer for the $50 Robot. Thanks to Jay at Thurinus Works for the Axon icon! Thanks to everyone on the forum who helped me debug the software.